Just a couple of hours on a plane will get you from Ireland to the Catalonia region of Spain. Barcelona, whilst being the country’s second most populated city, really doesn’t feel too big. Quite the contrary in fact. The city is small enough to walk almost anywhere – from the Barceloneta beach which rests warmly in the Mediterranean Sea, all the way up to the Placa De Catalunya which is the hub of the city centre. But if you don’t feel like walking, the transport links are excellent and cheap enough to whizz you from place to place in a jiffy. So, if you fancy a mini adventure or an extra-long lounge in the sea breeze, here are seven ideas on how to make the most of your weekend away. Once you arrive at the airport, a taxi, train, or bus will get you to the city centre in less than 30 minutes. After you’ve checked in to your hotel and dropped off your bags, there are so many options for activities and Barcelona is the type of place that has something for everyone. But I imagine you’ll be feeling a tad peckish and a bit parched from the journey, so why not head straight for Las Ramblas. 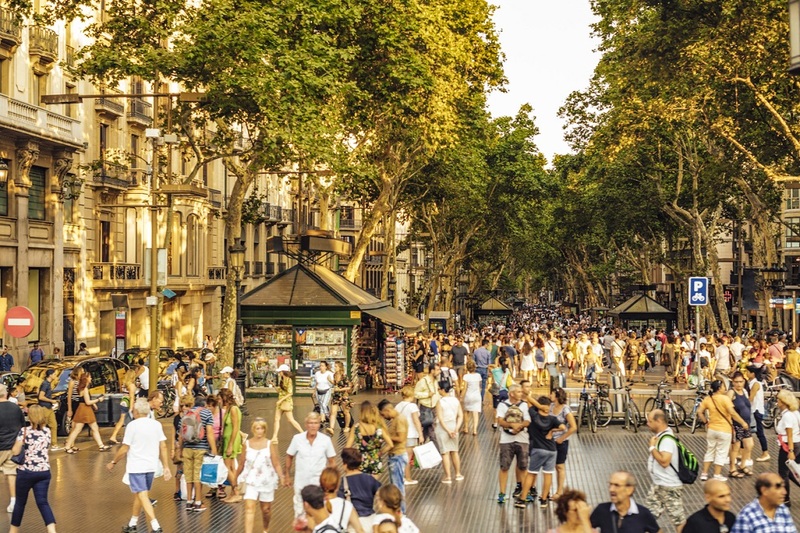 This strip connects the shopping district towards the Placa De Catalunya to the Port Vell harbour, and in between the two you will find a long line of restaurants and cafes. 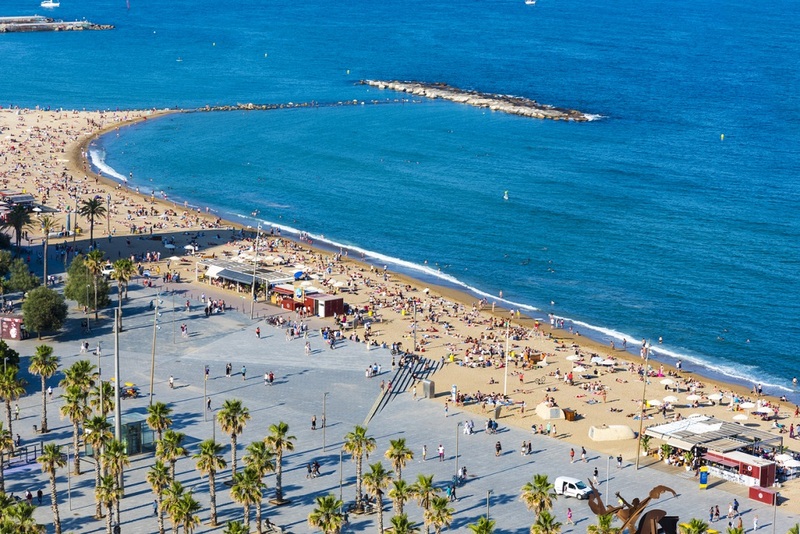 After you finish exploring Las Ramblas, head over to Barcelona’s oldest and most popular beach. It is crowded regardless of the weather and full of fun activities to do such as volleyball courts, football tables, playgrounds and even a gym area. There are loads of beach front restaurants to wine and dine during the evening too. This is the largest football stadium in Europe and second largest in the world with a capacity of 100,000! 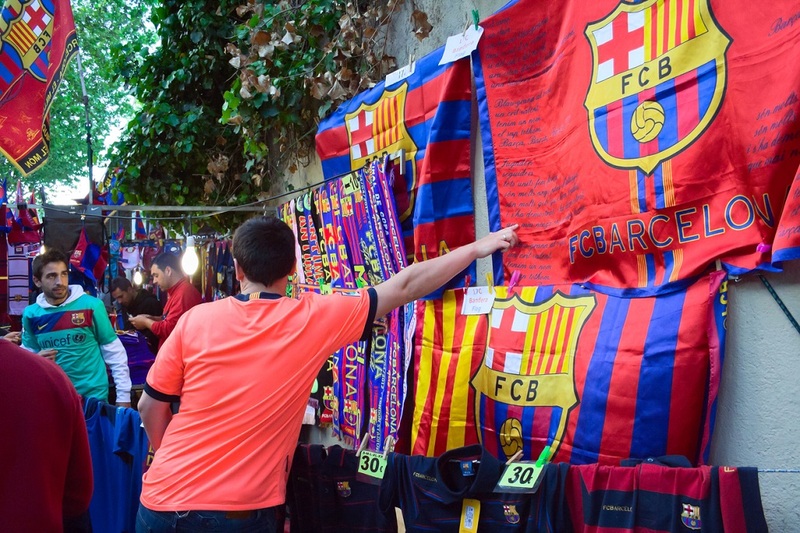 Tickets do sell out pretty fast and way in advance, particularly if you have hopes to watch an “El Classico”, which is the match between FC Barcelona and Real Madrid. However, the Camp Nou Football Stadium is legendary and one of the most famous football stadiums in the world, so a visit is definitely a must on your list, especially if you’re a football fan. Lucky for you, we sell tickets to the ‘Camp Nou Experience’ here where you’ll be able get inside the stadium and have an exclusive insider look of what happens on match days, visit their museum and get a closer look at all of the trophies and collector’s items! Barcelona is known as the capital of Modernism and the place where the famous architect Antoni Gaudí worked and lived. Gaudi, has left behind numerous treasures for us to discover in Barcelona, and taking a day to visit some of them should be at the top of your list! 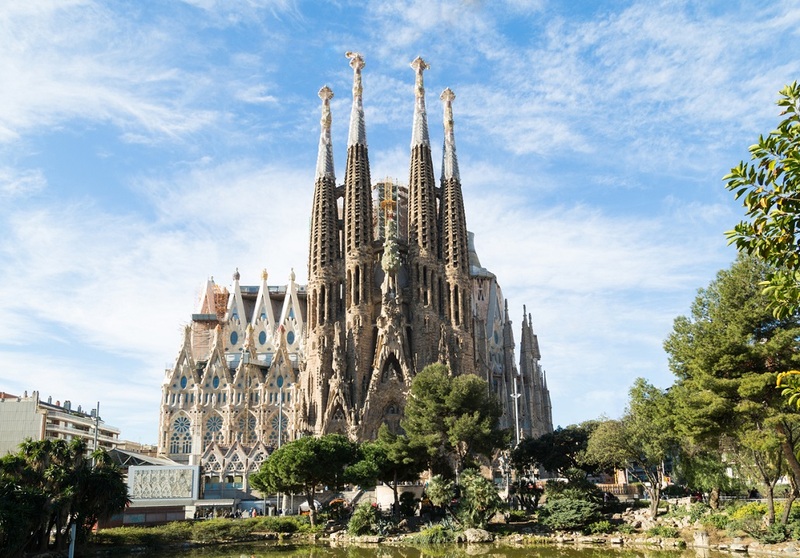 You can choose to visit The Sagrada Familia, which is one of the most beautiful churches in the world, due to its astonishing design inside and out. Or you can make your way up to the Park Guell which is also another incredible Gaudi project. Although it takes a bit of an extra effort to get up to the park from the centre, it is well worth a visit for the stunning city view you get from the top! By the way, we have just the right tour that can make things easier for you if visiting Gaudi’s architecture is top priority on your list – here. La Boqueria is one of the most famous places to visit in Barcelona. 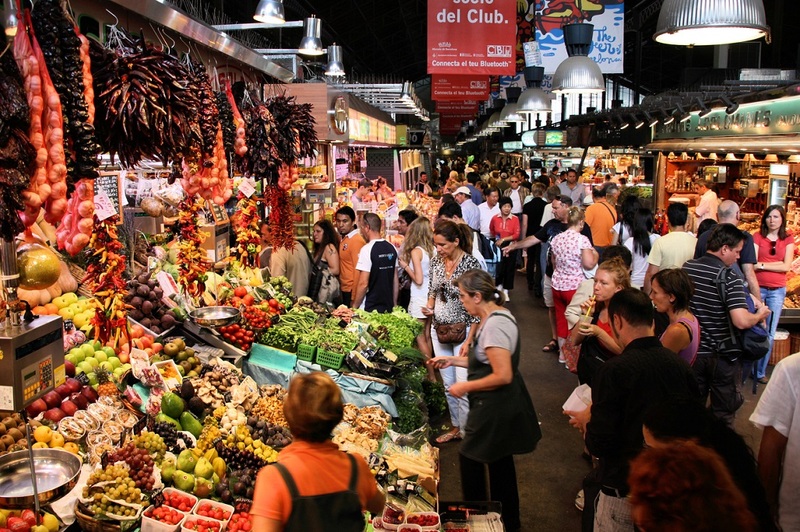 It’s a public food market just off La Ramblas, that you can easily make your way into and grab some lunch -with over 200 stalls to choose from! La Boqueria has also been listed as one of the best food markets in the whole of Europe, so it is quite busy during the day! The market sells all kinds of fresh food, from cured meats and seafood, to a variety of sweets, exotic fruits and (delicious) smoothies. 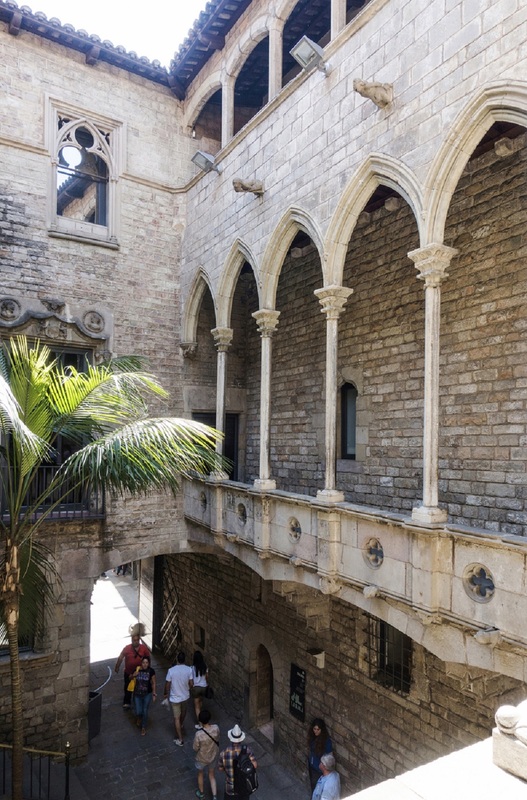 Going to the Gothic Quarter in Barcelona is like stepping back in time to a medieval Europe, with its’ tiny streets and walls that date back to the Roman times. Walking down Las Ramblas from Placa Catalunya, the Gothic Quarter is at the side of the city centre, so it is very easy to get to. 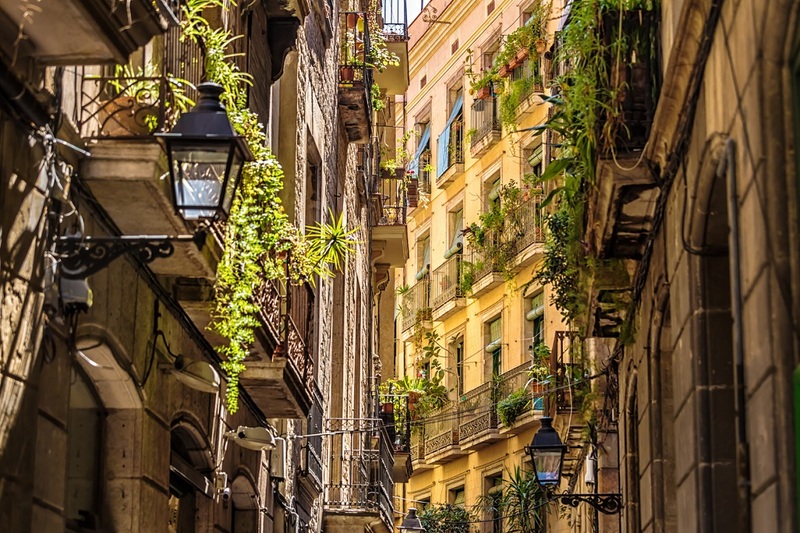 This is the old town of Barcelona and has many interesting streets and alleyways to wander around and get lost! The Picasso gallery is worth a visit for its’ architecture alone. There are over 3,800 paintings all divided into various periods of Picasso’s career chronologically from his earliest sketches to his final paintings. The district of El Raval where the museum is situated is also lovely, so spare a few minutes to stroll around the area which is full of quirky shops, trendy bars and restaurants. With plenty to see and much to do in this unique city, Barcelona is the perfect place to jet to on a Friday evening! Don’t just take our word for it, see it for yourself!